The Alexander Hybrid mattress by Nest Bedding is offering a luxury hybrid mattress at an affordable price. 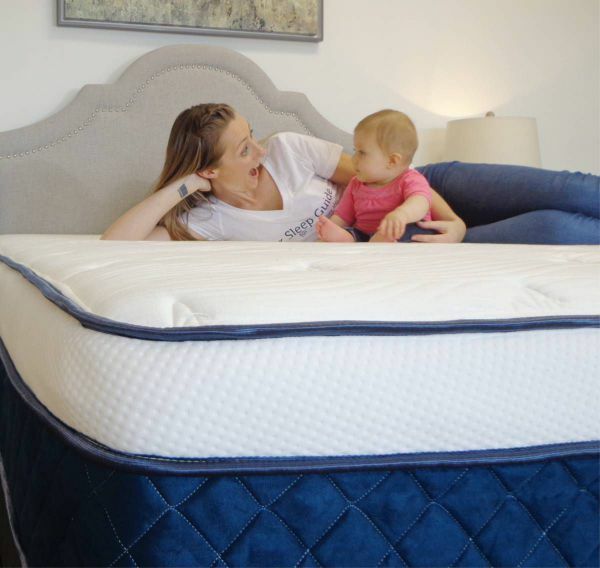 This mattress is taking Nest Bedding’s most popular all foam mattress and combining it with a durable coil system. This combination creates a perfectly balanced hybrid bed that incorporates innovative, high quality materials. Allowing Nest Bedding to bring a great sleeping, yet affordable, hybrid mattress to the market. If you enjoy the support of a coil system and the coziness of foam, the Alexander hybrid bed may be for you. This 13″+ thick mattress is available in three comfort options. A plusher option for the soft mattress enthusiast. A medium option that is the perfect balance and a “just right” feel. And a firmer option for someone who likes more support and denser foams. All of these options use a combination of quality, durable foams. Along with an ideally supportive thick coil system. These materials work together to create a perfect feel for each comfort choice. This mattress also provides good heat dissipation, perfect pressure relief and optimal spinal alignment. It also has minimal motion transfer and a consistent feeling, fully usable sleeping surfaces. Not to mention a great price that even comes with free shipping. As well as a 100 night sleep trial and a limited lifetime warranty. If you want an ideally balanced hybrid mattress that uses premium materials, look no further. Also, get the latest savings and discounts at NestBedding.com! Nest Bedding has grown and gained popularity in the last several years. With a product line that features thick and well made mattresses at an affordable price. As well as bedding accessories and products for the entire family. They are focused on being a once stop shop for all your bedding needs. Along with providing a full line of products they also offer top notch customer care and service. Making sure each product is made with the best and healthiest materials. And the service provided to each shopper is unbeatable. 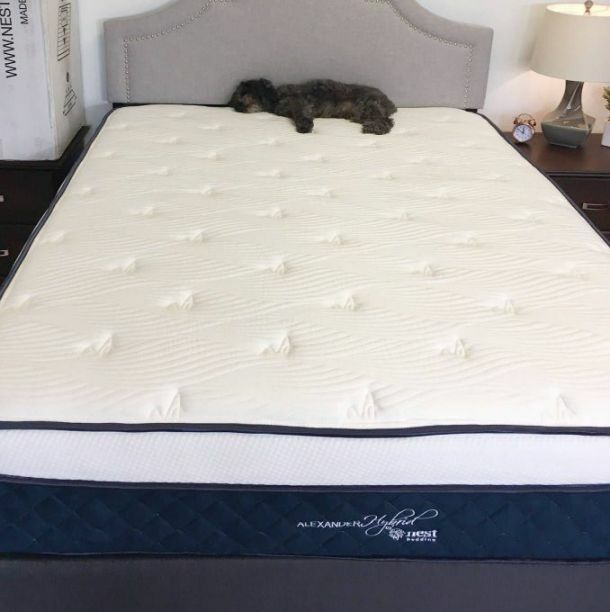 Below we have our in depth Nest Bedding’s Alexander Hybrid mattress review. We will go through how it performs for off gassing, comfort, motion transfer and sleeping cool. As well as edge support, value, materials and construction, trial period and warranty. Shipping is included with all Nest Bedding mattresses, including the Alexander Hybrid. Once your order is placed the mattress will be shipped out from their USA factory. Arriving to your door in just a few short days. When it gets there your next step is getting it to your bedroom. You may need two people to move this slightly cumbersome and heavy box, but it shouldn’t be too difficult. From there unbox the rolled mattress and position on your foundation or bed base and carefully cut the plastic away. Initially it will expand fairly quickly and come to life in a matter of minutes. One thing to not is that even though it may look ready to sleep on you probably want to give it a few hours to expand before sleeping. And at least 24 to 48 hours before the foams fully firm up and completely decompress. This is typical for any boxed mattress. Another thing you may notice during the unboxing process is a bit of off gassing. It will be minimal and the fumes are more of a “new” mattress smell than anything harmful. But the fragrance may be a bit off putting to anyone who is more sensitive to certain smells. To help air the mattress out we suggest leaving a window open as well as letting the mattress breathe and dissipate for several hours before putting your bedding on. Watch our video below to see just how easy the unboxing process is! The Alexander Signature Hybrid mattress comes in three comfort levels, plush, medium and luxury firm. The plush option provides a great combination of support and cushion. This option would work great for back and side sleepers and is going to be best for people who like a supportive feel but with still a little extra softness. This mattress will be a little softer than a medium feel and fall around a 3.5 on a firmness scale. With 1 being soft and 10 being firm. The medium feeling mattress is a great compromise of just plush enough and just firm enough. It works great for all sleeping positions and provides ideal support and comfort for all shapes and sizes. The medium option is a very balanced feeling bed that will also be great for couples or anyone who shares a bed. This mattress falls around a 5 on the firmness scale and is a true medium feeling bed. The luxury firm option is going to appeal to people who like to not sink in too much in the mattress and more than likely sleep on their stomachs and back. It will also work great for the heavier person who needs more support too. This option is going to fall around a 8 on the firmness scale. For our review we slept on the medium option nest bedding hybrid mattress. We were very delighted with the comfort of this mattress. It is much more of a true medium feel and fell at about a 5.5 on the firmness scale, with 1 being the softest and 10 being the firmest. It has a great amount of sink and hug but is well supported by the coil system. If you like the feeling of a little more cushion on the top but still has a solid foundation and supportive core than you will like this mattress, especially in the medium feel. If you would like a little more of a firm feel than the luxury firm option would be right up your alley. This mattress does have coils in it, however each is individually wrapped and underneath several inches of quality foams. These easily absorb vibrations and makes for very minimal to no motion transfer to be felt. It also is great that these foams are a more slow responding memory foam that don’t create excess buoyancy. This mattress is great for anyone who shares a bed because of this, there will be little disturbance when getting in and out of bed. While sleeping on this mattress we noticed very little movement being transferred when moving about or when getting up. If you are more sensitive or more disruptive when getting in and out you may notice a bit of movement, but nothing overly concerning. We noticed very little problem staying cool on this mattress, even with the more hugging top layers. Typically hybrids are cooler sleeping, but memory foam does absorb more heat. Making the combination of materials on this mattress work with and against sleeping cool. To help keep the mattress more temperature neutral overall the Alexander Signature Hybrid mattress features thermic phase change cooling fabric on the surface. Aiding in keeping the surface cooler to the touch. The layer of memory foam is also infused with copper. This natural element helps heat retention stay at bay by pulling heat away from the body. It is also antibacterial making the mattress cleaner too. Under the Memory Foam is SmartFlow Support Foam with is punched with holes. This helps alleviate any retained heat too. 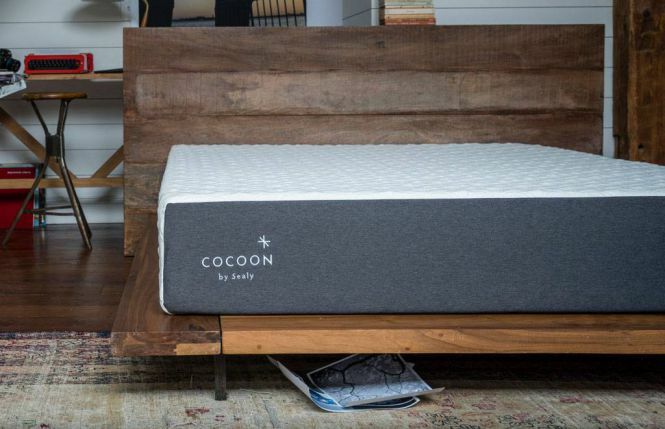 The cherry on top is the individually wrapped 5 zone edge support coil system that will certainly dissipate any heat held from the foams making this mattress sleep fairly temperature neutral all together. We found the edge support on the Alexander Signature Hybrid mattress to feel stable and creates a solid, edge to edge usable sleep surface. The edge support pocketed coils provide the necessary support to give the entire mattress a solid foundation, including the edges as well. Sleeping on this mattress you are able to feel a consistent feel across the entire top of the bed. As far as sitting on the edge goes, there is a little less support, but is still very solid for minimal sitting use. This is certainly helped by the coil system that has a reinforced edge as well as the denser foams that hold their shape and make a consistent feel throughout. As far as the value of this mattress goes, the price point for the most common size, the queen, is $1199. This includes free delivery, a 100 night sleep trial and a limited lifetime warranty. For a thick and durable true hybrid mattress that features the pressure relief of memory foam you are getting a good deal for this price. The quality and comfort of this mattress are ideal for almost all sleepers. Giving you plenty of options. The added bonus of this bed is the latest coupon available that makes it even more affordable. Make sure you check out the latest savings at NestBedding.com to get the best pricing for this mattress! The Alexander Hybrid mattress has a 100 night sleep trial period. This is the online mattress industry average and what is typical offered. This trial period allows for a sufficient amount of time to see if this mattress is a good fit for you and also has a very easy return process if it isn’t. 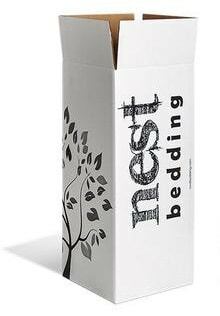 If you are looking for more specifics for the Nest Bedding trial period and warranty find out more at NestBedding.com. Or for a helpful tool check out Our Mattress Warranty & Trial Period Guide. If you want a thick hybrid mattress that has durable coil system and ideal memory foam comfort layers the Nest Bedding Alexander Signature Hybrid is for you. This mattress really checks almost all the boxes and will deliver on comfort, support and value. 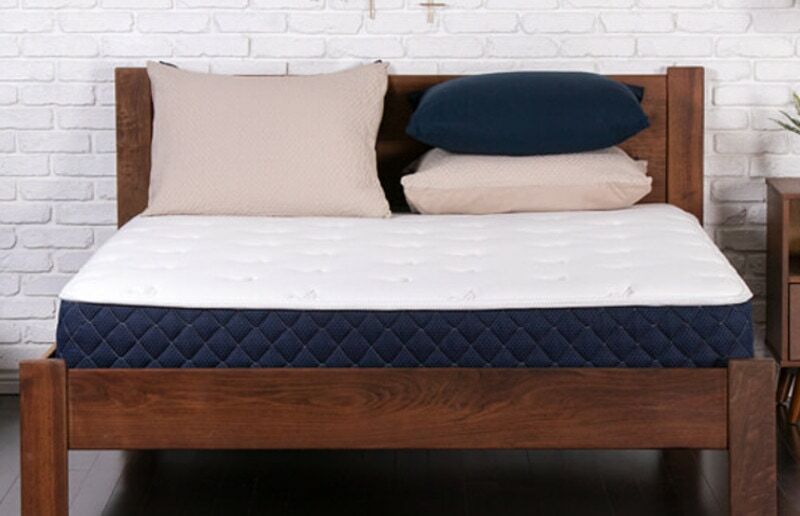 Buy Your Alexander Hybrid by Nest Bedding Mattress Here LATEST COUPON! You want a solid, well constructed thick hybrid mattress with durable materials that won't break the bank. You like the option of choosing your comfort but regardless will have ideal adaptable support, minimal motion transfer and won't get too warm. 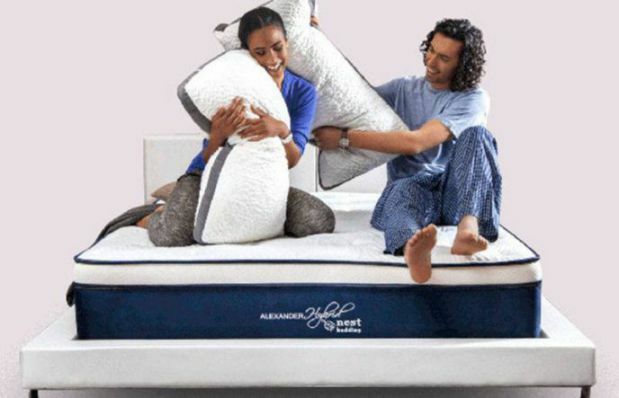 CLICK BELOW to SAVE with the latest coupon on the Alexander Hybrid Mattress by Nest Bedding!